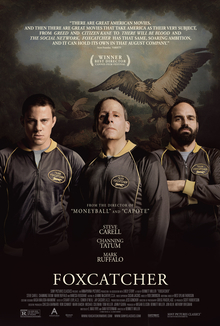 The greatest Olympic Wrestling Champion brother team joins Team Foxcatcher led by multimillionaire sponsor John E. du Pont as they train for the 1988 games in Seoul – a union that leads to unlikely circumstances. ‘Foxcatcher’ is an early contender for the year’s best film, a gripping film about the true events surrounding the training camp set up by billionaire John Du Pont to help train Olympic wrestlers. The primary focus is on Du Pont’s relationships with the gold medal winning Schultz brothers, primarily Mark in the early stages before Dave starts to feature more prominently later on. The film feels like a Shakespearean tragedy, with every scene laced with tension and an overwhelming sense of dread (this mood is heightened by the minimal use of music so when it was used it felt more impactful). Very much a character piece, ‘Foxcatcher’ is a slow burn that creeps under your skin with a mesmerising portrayal of psychopathy. This disturbing true crime story is brought to life by three actors in the form of their lives. As John Du Pont, Steve Carell is barely recognisable under a prosthetic nose as the actor more commonly known for comedic roles, and his chilling performance is frighteningly good, whilst Channing Tatum has never been better as gentle giant, Mark Schultz. As Mark’s older brother Dave, Mark Ruffalo has less to do yet he gives a reliably excellent performance as the family man looking out for his younger brother. All three actors are pushed to the boundaries of what they’re capable of, and they rise to the challenge superbly. Sienna Miller (as Dave’s wife) and Vanessa Redgrave (as Du Pont’s mother) also feature in small, but key supporting roles. One of the film’s key themes is the nature of masculinity, and this is at its clearest through the character of Mark Schultz. The appearance of a huge, muscular guy on the outside masks the soft, brooding centre and demons that are left to fester on the inside. On the contrary, Du Pont is small and schlubby, and he both admires and resents the masculinity he can see in Mark Schultz and his fellow wrestler’s outward appearances. Despite his vast wealth, Du Pont is a man who has grown up without any friends, and who seeks happiness through the achievements of others. Hints of the reasons behind this are shown through a couple of scenes that either feature or reference his overbearing mother, who seems to be a key reason for Du Pont becoming the kind of man that he is. The dysfunctional relationship that develops between Du Pont and Mark Schultz is one of the primary focuses of the film, and the intensity of the scenes between these two characters gives off the feeling of a noose tightening with each subsequent scene. Mark Schultz came from a broken home, and he lacks the family or support network that his brother has, and he found a father figure in John Du Pont. In De Pont’s case, he found another lone wolf who he believed he could start a friendship with, until this started conflicting with his aspirations for the US wrestling team. The film may be about wrestling, but the sport itself is a sideshow to the themes director Bennett Miller wants to explore, such as the psychology behind an athlete, and the psychology behind the enigma that is John Du Pont. In both cases, he succeeds remarkably. From the terrific script to the phenomenal performances, ‘Foxcatcher’ is a triumph on almost every level, and it’s one of the best films you’ll see this year. Director Bennett Miller has crafted an outstanding and detailed character study from this powerful true crime story that resonates long after the credits stop rolling. I highly recommend it.